HANNOVER, GERMANY – April. 1, the Industrial Renaissance is coming. Today, DOBOT, the global leading provider of all-perceptive industrial robotics solutions, announced the official debut of its ground-breaking-ly cost-effective collaborative 6-axis robot arm – DOBOT CR6-5, at the Hannover Messe show, marking DOBOT’s yet another footprint on the forefront of robotics automation. DOBOT CR6-5 is now entering production and will be the second robot arm to slot into the DOBOT collaborative robot Series. DOBOT is the first offering a highly cost-effective intuitive 6-axis collaborative robot arm that is safer, more versatile, and more productive for their human workmates to work alongside not only in the light manufacturing industry, but also in small- and medium-sized business scenarios. 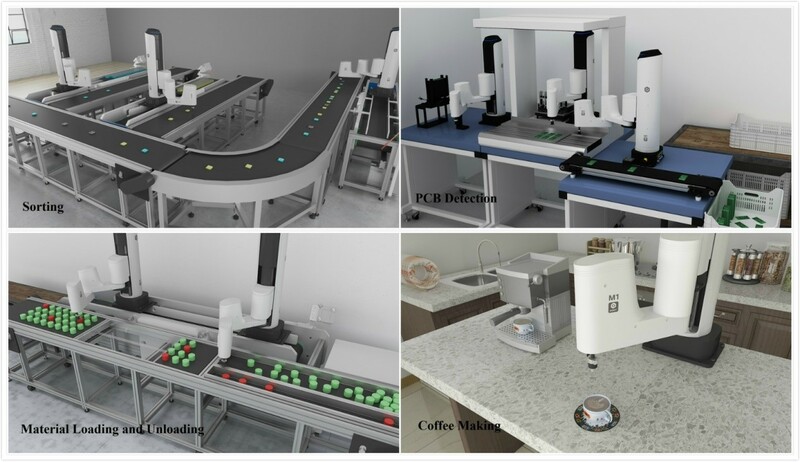 From April 1 to 5, DOBOT will showcase a numerous of demos including Teach a Robot to Follow Suit, Personal Coffee-making Master, Accurate Picking and Categorizing, etc. to commemorate the start of its next-generation collaborative robot arm CR6-5 in Hall 17, Stand E76-4, as well as a rich array of its award-winning products: the all-in-one lightweight intelligent training robot arm DOBOT Magician, the lightweight 4-axis collaborative robot arm DOBOT M1, etc. for STEAM education, business and industry. DOBOT CR6-5 robot arms are aimed at small- and medium-sized business owners, educators, and anyone else that wants an intuitive robot arm they can control with ease. Whether free and flexible movements or defined sequences, thanks to its compatible design, the inexpensive DOBOT CR6-5 robot arm can be used for various applications. When mounted on various adaptive grippers, it can pick up and handle a wide variety of objects and shapes. The arm has highly accurate linear movement and can do all sorts of things from handheld teaching (through a teach pendant) to reproducing accurate moving path, to brewing coffee in a café, to being used in a lab setting. At the same time, it is completely compliant and poses no danger to the user even in the event of a collision. As a 6-axis, high accuracy, high repeat precision robot arm using a dynamic algorithm, DOBOT CR6-5 helps reinvent traditional coffee shops, factories and beyond, essentially serving as a platform to help speed up the time-consuming automated robotics development processes. 1. Multiple and Intuitive Control Methods: DOBOT CR6-5 supports connection through mobile APP, teach pendant and PC, allows users to control the robot arm to fulfill different tasks with like production and packaging work anytime and anywhere. 2. Single-hand Handhold Teaching & Anti-collision Detection: ensure the safety of operations and quick deployment of work points. 3. Performance-driven: the starting speed, stability, and precision are all properly ensured based on the optimal results of intelligent algorithms. DOBOT CR6-5 can accurately identify different environmental parameters and intelligently adjust them to enable high-speed reaction, anti-interference and end jitter suppression. 4. Easy Operation & Smart Control: DOBOT CR6-5 automatically runs at adaptive accelerating/decelerating parameters and keeps its optimal performance, no complicated adjustments required, with both the high speed and operating life of the whole machine are fairly taken into account. 5. Accurate Trajectory Reproduction: It can accurately move along a given trajectory at both high and low speeds, with a trajectory accuracy of 0.2mm roundness error at 1m/s speed. 6. Google Image & Voice recognition Can be Integrated: Supports chip implantation like Google TPU2 and TensorFlow chips for feature extraction, pattern matching and model training, etc., further expanding the application possibilities in AI-related areas like image recognition and voice recognition. 7. High Precision and Large Payload: DOBOT CR6-5 perfectly combines the advantages of lightweight industrial robots and collaborative ones, with position repeatability of 0.03mm, a maximum working range of 902mm, and a rated payload of 5kg. 8. Intelligent Interfaces for Hands-on Applications: Standard intelligent interfaces and free choices of programming languages allow users to choose different accessories at their will, such as grippers, intelligent cameras, force sensors, etc., to achieve numerous practical functions. Prior to DOBOT CR6-5, numerous of applications of DOBOT’s collaborative robots like the award winning lightweight 4-axis collaborative robot arm DOBOT M1 and industrial robot arms (DOBOT SR and SA series) have been successfully carried out in real-world settings like assembly lines in toy factories, Adidas’ clothing production lines and automatic sewing application for automobile related productions. In other words, productivity skyrocketed. A clear signal that manufacturers have been investing in tech and that the DOBOT cooperative robot arms were able to successfully fulfill a variety of tasks and had grasped a brand new series of application scenario to their future-proof clients. "Collaborative Robotics is the next frontier of both industrial and assistive robotics," says Zhufu Liu, Head of R&D at DOBOT. "For this reason, we need a new generation of robots designed to interact with humans in a natural way. These results will allow us to instruct the robot to manipulate objects as a human collaborator through the introduction of simple software." Now that the international team at DOBOT has made a breakthrough in developing versatile, robust, cost-effective and safe robotic grasping and manipulation capabilities, they have proceeded on testing its further applications in education, new retail, medical treatment, 3C, clean energy and more. Having generated over EUR 17.1 million in revenue in 2018, DOBOT’s industry robot arm line sales volume contribution ranked No.8 on the yearly sales volume of all industrial robots in China chart according to GGII’s Industrial Robot Industry Research 2018, right behind brands like Epson, ABB, and ranked the No.1 Chinese Industrial Robot Arm Provider for having sold the largest volume among all Chinese industrial robot arm brands. DOBOT values the importance of meeting the needs of customers across the globe, so the DOBOT team enhances its ability to serve the customers by helping customers test their DOBOT CR6-5 applications on-demand and run multiple robot arms in parallel, ensuring the arms are primed for quick adoption and available at a modest price point. DOBOT now starts taking orders for the DOBOT CR6-5 robot arm immediately. For more information, please contact sales@dobot.cc or visit Hall 17, Stand E76-4 at the Hannover Messe 2019. Founded in July, 2015, DOBOT is a global leading provider of all-perceptive intelligent robotics solutions, focusing on the development of all-perceptive intelligent robotic arms that integrate perception and interaction. Thanks to its remarkable breakthroughs in vision, control, servo drive, and robotic body, DOBOT products are selling in more than 180 countries and regions around the world, widely used in education, industry and business. Globally, DOBOT has an extensive network of over 100 key distributors, servicing over 200,000 users today. DOBOT was named one of the World's 80 Most Valuable Robot Companies by CB Insights, ranked among the Hurun Top 100 Most Valuable New Star Enterprises in China, and the Top 80 Artificial Intelligence Companies in 2018. To learn more, visit www.dobot.cc. Dobot.cc © Copyright 2019. All Rights Reserved.